The Los Angeles Stadium and Entertainment District at Hollywood Park is a sports and entertainment district currently under construction in Inglewood, California, United States, about 3 miles (5 km) from Los Angeles International Airport and adjacent to The Forum. The stadium will serve as the home of the Los Angeles Rams of the National Football League (NFL) when it opens in 2019. 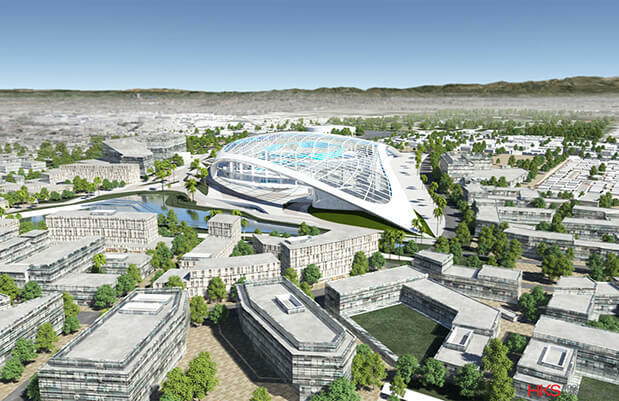 The stadium is a component of the City of Champions Revitalization Initiative, the working title of the development on the site of the former Hollywood Park Racetrack. On January 5, 2015, it was announced that Stan Kroenke, the owner of the then St. Louis Rams had partnered with Stockbridge Capital (owners of the Hollywood Park Land Company), to build an NFL stadium on the existing Hollywood Park development and on a parcel of land owned by Kroenke. After collecting more than 20,000 petition signatures to allow for the rezoning of the proposed stadium site to allow for an NFL venue on the site, the Inglewood City Council approved the stadium with a unanimous 5–0 vote removing any possible legal obstacles.